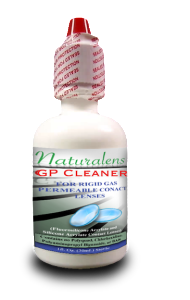 Naturalens GP Cleaner is a sterile cleaning, disinfecting, and storage solution for use with fluorosilicone acrylate and silicone acrylate rigid gas permeable (RGP) and hard contact lenses. WARNING: DO NOT PUT IN THE EYE. SOLUTION MUST BE COMPLETELY RINSED. 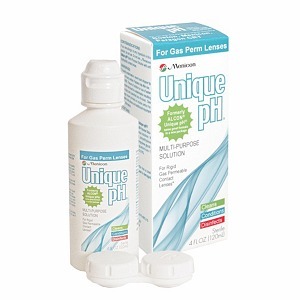 Menicon Unique pH®, formerly Alcon Unique pH, is a highly effective and well respected multipurpose solution for gas permeable contact lenses. Simply by soaking your lenses, it removes dirt, protein deposits, and debris from your contact lenses. No separate daily cleaner is required. This solution conditions lenses by adjusting to the eye’s natural tear pH to enhance the wettability and comfort of gas permeable contact lenses on insertion. This formula is designed to provide a soothing effect during lens wear. 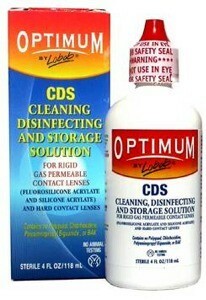 Optimum CDS – Cleaning, Disinfecting & Storage Solution is your sterile cleaning, disinfecting, and storage solution for use with fluorosilicone acrylate and silicone acrylate rigid gas permeable (RGP) and hard contact lenses. WARNING: DO NOT PUT IN THE EYE. SOLUTION MUST BE COMPLETELY RINSED. 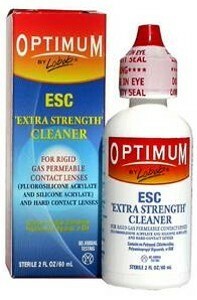 Optimum ESC – Extra Strength Cleaner is your sterile non-preserved cleaning solution for use with fluorosilicone acrylate and silicone acrylate rigid gas permeable (RGP) and all hard contact lenses of any polymeric structure. WARNING: DO NOT PUT IN THE EYE. SOLUTION MUST BE COMPLETELY RINSED. 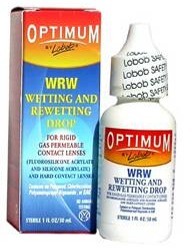 Optimum WRW wets lenses prior to insertion. Also use directly in eye during the wearing cycle to relieve occasional dryness and discomfort. Optimum Contact Lens Wearers Hand Soap is a liquid biodegradable, unscented, hypo-allergenic soap formulated for contact lens fitting professionals and their patients. It contains 22% glycerine that will keep the hand tissues soft and tend to keep the hand surfaces from cracking from frequent cleansing. A pure and gentle formulation, free of animal ingredients, artificial coloring agents, or irritating oils. No perfumes are used to eliminate causes for sensitization (allergy). It is supplied in a 12-oz (354 mL) pump-dispensing containers. WARNING: DO NOT PUT IN THE EYE. RINSE HANDS COMPLETELY PRIOR TO HANDLING CONTACT LENSES. 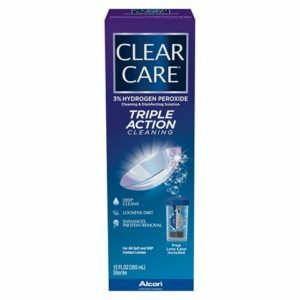 Clear Care is a convenient and highly effective hydrogen peroxide based system for simultaneous cleaning, daily protein removal and disinfecting of soft (hydrophilic) and rigid gas permeable lenses as recommended by your eye care professional. 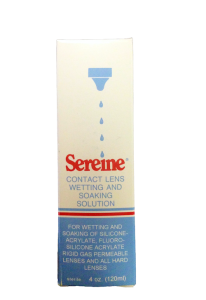 Sereine 4oz contact lens wetting and soaking solution disinfects Silicone–Acrylate, Fluoro–Silicone Acrylate rigid gas permeable lenses and all hard lenses. When used according to package directions, Sereine Wetting and Soaking Solution increases wearing time and comfort. 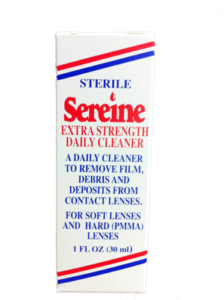 Use in conjunction with Sereine Contact Lens Extra Strength Cleaner for best results. Formulated for sensitive eyes. Removes debris and lens deposits. For all types of soft contact lenses, silicone hydrogels and hard lenses. 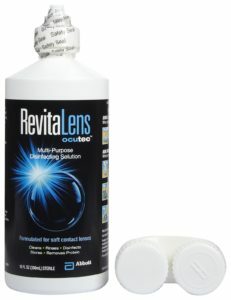 Loosens and removes accumulations of film, deposits and debris from your lenses. Preservative free. Does not contain Thimerosal or Chlorhexidine. Everything you need for insertion and removal of Scleral lenses. Includes the following: Two (2) Unique Ph 4oz, Naturalens GP Cleaner, 50 5ml Addipak Vials, Natural Ophthalmics Forte Eye Drops, Contact Lens Case, DMV Scleral Inserter & DMV Ultra Remover. 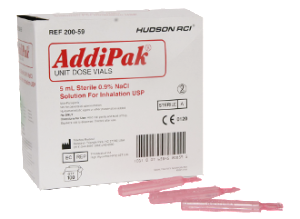 Each box of Addipak Saline is filled with 100 – 5ml vials filled with 0.9% Sodium chloride saline solution. Each unit dose of saline has an inverted milliliter graduation on the vial for accurate dispensing. Hudson RCI Unit Dose Saline vials are color coded and ready to use. 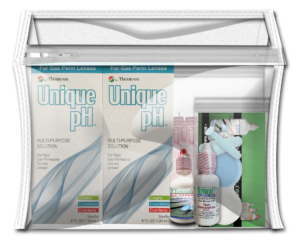 This unit dose saline is preservative-free and contains no bacteriostatic agents or buffers. Sterile. Ocular allergies are a chronic condition expressed as the body’s over-activity in triggering and carrying out the inflammation cascade leading to the common symptoms of itching, burning, watering and redness. Stop your allergy symptoms such as itching, burning, watering, edema and general ocular sensitivity with Natural Ophthalmics awesome formula. Our treatment strategy is to stimulate and support the body’s tissues, organs and functions which keep the lens healthy. There are no blood vessels to the crystalline lens which needs oxygen, nutrition, detoxification and anti-oxidation. Homeopathic Cineraria is a safe lymphagogue that gently triggers the body’s mechanisms to transfer oxygen and nutrients from the blood to the aqueous which nourishes and detoxifies the living tissue of the crystalline lens. Cineraria maritima has been used homeopathically for over one hundred years to safely and effectively treat cataract. It is the treatment of choice in Europe, India and South America. These eye drops stimulate the production of all three tear film layers while supporting the health of the cornea, conjunctiva and eye lid. Two separate formulas, one created specifically for women. Both formulas share five powerful broad spectrum ingredients which relieve symptoms caused from inflammation due to aqueous deficiency, including severe dryness such as with Sjogren’s Syndrome. Additionally, women experience more dry eye symptoms due to hormonal fluctuations so we added the two most commonly prescribed ingredients for these symptoms. Oral Spray for dry eyes, glaucoma, floaters, cataract and macular degeneraion. Ingestion of nutrients by “Oral Absorption” increases uptake up to 90% vs. 20% for intestinal absorption of pills. This treatment contains the most important and highest quality ingredients to: protect against UV oxidation damage, increase oxygen and nutrient conversion to the aqueous, improve blood flow and provide important ingredients for lens clarity. Especially important – for patients with digestive problems or deficiencies such as reduced beneficial bacteria from antibiotics or those having difficulty swallowing pills. 10oz bottle. Peroxide-quality disinfection. Excellent lens-wearing comfort. Designed for silicone hydrogel and all other soft contact lenses. Advanced Science Takes Disinfection to a higher level. Abbott Medical Optics Inc. collaborated with world-class experts on this truly unique, next generation MPDS. Over 600 eye care professionals contributed to our research, enabling us to effectively understand and respond to their needs. The result is a high-performance formula that delivers quality disinfection compatible with silicone hydrogel and conventional soft contact lenses. Protects your patients from emerging pathogens. Superior disinfection against Acanthamoeba. Helps protect your non-compliant patients from lens case contamination. Sustains antimicrobial activity in the lens case to help protect even your non-compliant patients. Ocular Integrity & Lens Compatibility. Low incidence of corneal infiltrates. Low corneal staining and adverse events. Excellent protein removal and lens cleaning. Conditions the lenses for increased lens-wearing comfort. Provides 16+hours end of day comfort.